Thank you for playing Miku Flick. We are sorry to announce that service for Miku Flick will end at 11am (JST) on September 29th, 2017. The game went live on March 9th in 2012, and we have constantly strived to deliver a fun and engaging experience. We hope you enjoy the rest of your experience with Miku Flick. ◆ Selected for the App Store BEST of 2012 "Hidden Gems: Games" Category! 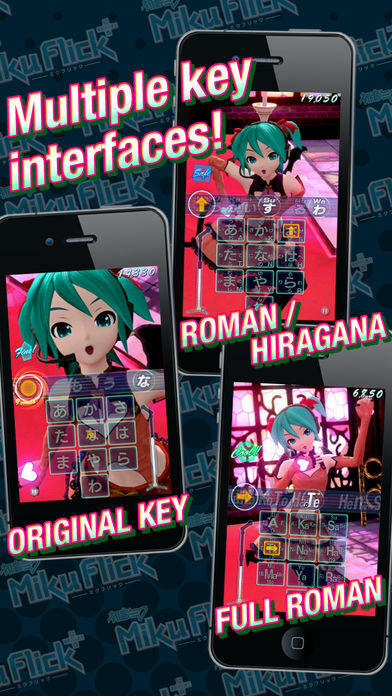 Miku Flick utilizes the Japanese Flick Input method with Japanese characters. Users can switch to Romanized Lettering by selecting either “Full Roman” or “Roman Support” under Options -> Keyboard Menu. Achieved No. 1 App in the "All Games" Category in Japan! 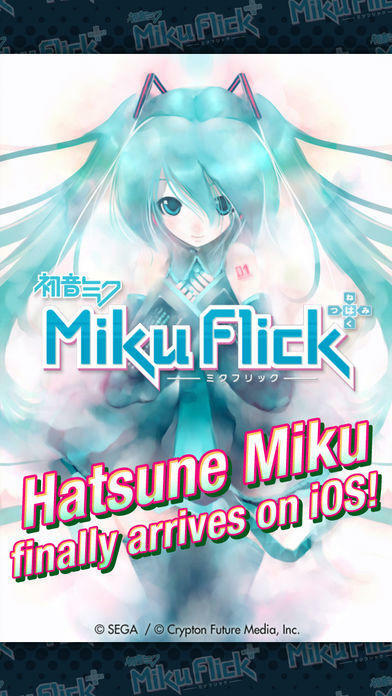 Hatsune Miku arrives on iOS with Miku Flick! 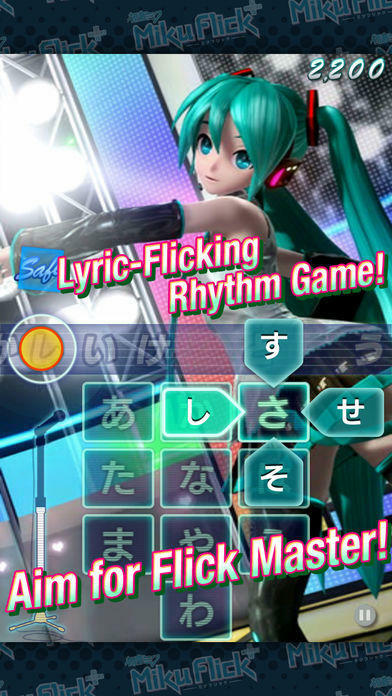 Flick characters in time with the lyrics of Hatsune Miku’s most popular songs in this new rhythm game! Match your flicks with on-screen lyrics to score points and clear songs. Each cleared song will unlock additional Miku content to play and watch in “PV Mode”! Become a “Miku Master” and challenge your friend’s high scores over Game Center! The more you play, the more you get! 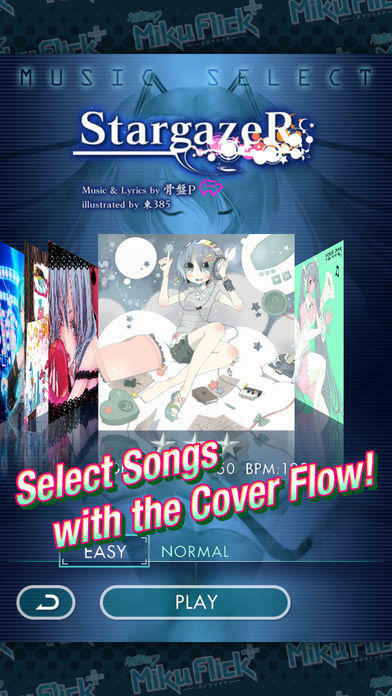 Clearing songs will unlock additional songs up to a satisfying 12 hit Hatsune Miku tunes. 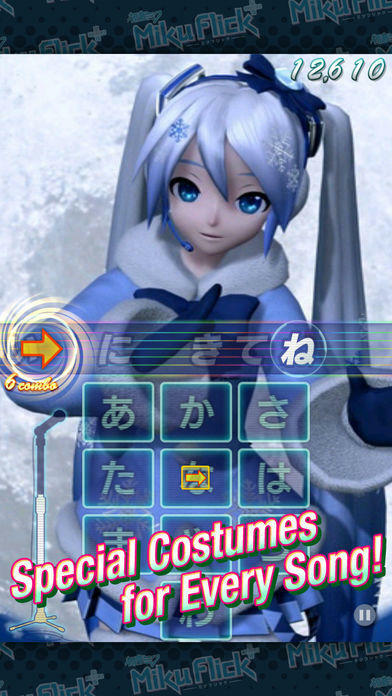 Turn your iOS device a Miku performance stage! Each song features four increasingly intense levels of difficulty to challenge your flicking skills. Once you’ve cleared a song, sit back and enjoy the music video in PV Mode! Complete in-game challenges to unlock Achievements and compete with other users’ high scores over Game Center! NOTE: Miku Flick only supports English and Japanese menus. For inquiries regarding this app, please note that SEGA currently only accepts correspondence in English or Japanese. ・Fixed an issue that force closed the app, without registering the score, after playing songs under certain conditions. ・Fixed an issue that didn’t reflect and save the combo/results on the Results screen after playing certain songs. ・Reduced the number of potential app force closures from memory overload, by streamlining the memory distribution process.